Here we go again - holiday party planning time is just around the corner! Throwing a holiday party is all about fun, festive decorations, and joyous times spent with loved ones. If you experience anxiety or get nervous when it comes to making sure everyone has a good time, relax! With a little bit of organization and a few unique ideas, making memories at your party is easy! Don't want to have your party at home? No problem! Many local restaurants, hotels, and other meeting venues would provide an elegant backdrop to your holiday party. Some will host parties as small as 10 people! With all the hustle and bustle around the holidays, many party planners love the idea of having someone else handle the food, the decor, and the cleanup. Or if you would prefer, you can host an elegant party right in your home. Choosing the right venue can make all the difference for the atmosphere you want to create for your holiday party. If your party is the sort to require invitations, they can really set the tone for your get-together before anything else. Be creative with them, and as clear as possible about the start and end times, dress code required (if any), and be sure they get out two to three weeks beforehand so your guests have time to plan ahead. For the holiday season, candles and white lights are an inexpensive and elegant way to play up any theme! Natural greens, seasonal fruits and vegetables, and a beautiful ribbon can create simply stunning centerpieces or wreaths, and grace your mantle like nothing else. Inexpensive tea lights and candles are always a good bet for setting an elegant and festive mood. Unless your party is a sit-down dinner, you'll want to have plenty of snacks, appetizers, and hors d'oeuvres ready to go. Whether you're planning to offer a more substantial menu or intend to stick to simple fare, you could put out a few cheese platters, each with something a little different: some with fruit, baguettes, and a delicious spread, and some with crackers, apples, and mustard. 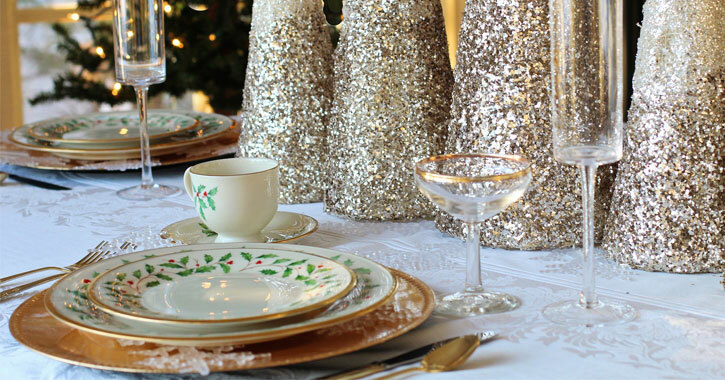 Fortunately, holiday parties are the perfect time to use attractive paper plates, cups and napkins, plastic cutlery, and even disposable tablecloths, making for a fairly easy clean up for you. Have guests you really want to impress? Hire a local Saratoga caterer! Gear your tunes to your guests, but don't be afraid to mix it up, and include plenty of holiday themed music! Put together a playlist with a nice variety of classic holiday songs mixed with more modern, celebrity renditions of holiday songs. Have some fun with it! If you want to get a dance party going, plan ahead where you'll move furniture around to make room. Holiday parties are a great opportunity for giving. Consider adding a "cover charge" to your invitation that includes a small, unwrapped toy or a non-perishable food item to be donated to a local charity or nonprofit. Don't have a huge party budget to work with? Not to worry! A little ingenuity and your guests will think your event was created from beginning to end by your own personal event planner. Party food doesn't need to break your bank: homemade pizza, 6-foot long subs, finger sandwiches, and vegetable trays are always a big hit. Or, you could make the party a pot luck, with each guest bringing their favorite dish or dessert! So, relax and enjoy the holiday season! Your party will be great, the guests will be fed, and everyone will have a great time!